Florida State Seminoles guard Aaron Thomas (25) steals the ball away from Virginia Cavaliers guard Justin Anderson (1) during the first half. 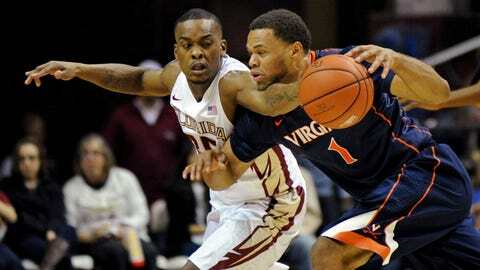 TALLAHASSEE, Fla. (AP) — Justin Anderson scored 16 points and Akil Mitchell added 11 points along with 13 rebounds Saturday to lead Virginia to a 62-50 win at Florida State in the Atlantic Coast Conference opener for both schools. Virginia (10-4) jumped to an early 6-0 lead and never trailed as it bounced back from an embarrassing 87-52 loss Monday night at Tennessee. The Cavaliers led by as many as 15 in the opening half and 22 in the second half. Capitalizing on a 20-2 scoring advantage off 13 Florida State first half turnovers, Virginia built an early 28-13 lead on its way to a 30-17 cushion at the midway break despite losing the services of scoring leader Joe Harris early in the game. Anderson and freshman London Perrantes took up the scoring slack for the Cavaliers with 10 points apiece in the opening half. Perrantes finished with 14 points and teammate Malcolm Brogdon added 11. Harris played less than three minutes without taking a shot before being injured during a scramble for a loose ball. He remained dressed and on the Cavalier bench for the remainder of the game. Virginia officials wouldn’t say what injury Harris suffered, although it appeared he was checked for a possible concussion. Florida State (9-4) went the opening five minutes without a score until Okaro White’s 3-point shot from the side. White was Florida State’s lone double-digit scorer with 15 points.